You’d think that my being a reading specialist and having to deal with children, their parents, and teachers on a daily basis would mean I’m organized. Right. I am. On the job. But in my personal life, well, something just always seems a bit out of synch. Take the fact that this is December 7th, 18 days until Christmas day! My good friend, and coincidentally a teacher, Sally-Jo Baker has done all her shopping, wrapped the gifts, sent out her Christmas cards and started baking and freezing cookies. Already! And it’s only the 7th. And to top it all, she has a wedding on her mind, too. Do I feel inadequate next to Sally-Jo? Well, it depends on which of the tasks is like a ticking time bomb at the moment. Right now, it’s the cards. I love receiving and also sending traditional Christmas cards. You know, the paper kind that require a postal address and stamp. So, they should be in the mail by now but I haven’t even bought them yet. Tomorrow after school. That’s the plan. I have to admit that when I think of Christmas these days, it’s tinged with a queasy feeling, but only for a second, thinking back to that day an author was shot dead in my living room. That happened in Read and Buried, the second book in the series. I try to snap right out of it with thoughts of my choir singing at the late night Christmas Eve church service, and having brunch with my mama, and all the trimmings with my friends from the Ashton Corners Mystery Readers and Cheese Straws Society later in the day. And, hopefully, some quiet time with my guy, Mark Dreyfus. I am truly blessed and Christmas is the time I feel it the most. So, the tasks will all get done, I do know that so won’t stress – too much. The warmth and happiness is a given. That’s my wish to all of you and I know my book reading cohorts send their wishes too. 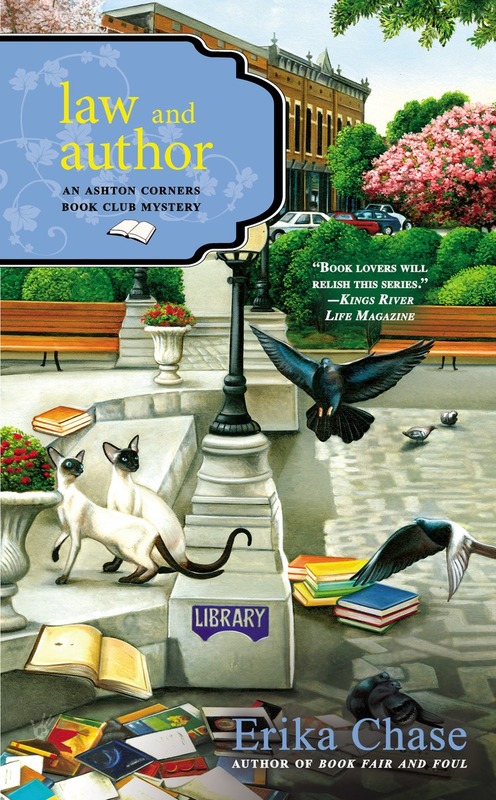 My author is celebrating by offering your choice of any of the five Ashton Corners Book Club Mysteries to one lucky person who leaves a comment before noon EST tomorrow. Happy Seasons Readings! Not a time to stress. Just relax and enjoy. Books about books and book lovers are a treat. Yours are new to me, so it's a double treat! Thank you for the lovely giveaway! Merry Christmas and Happy New Year. The same to you, Jen! Except for the murder part, this sounds like me. I think I'm so organized but then it's almost Christmas and I've hardly started. Thanks for the giveaway. You're welcome, Sally! Good luck. Certain things are easy to let slide, so I can sneak in more time for baking or reading! Thanks! Thanks! Hope you think so. You've got a good grip on it, Dianne! I do like to read to avoid getting too stressed. Best therapy, for sure Debby! Thanks so much, Ruth! Lovely to hear. My pleasure, Sandy. Hope you'll try every day. Hope you'll give it a try, Mary Louise! I try not to stress too much also, but there are times in the wee hours of the morning when I wonder how I will get it all organized before Christmas. But I am not the reason for the season so I should not let it bother me too much. Thanks for the chance to win! Good thinking, Elaine! Good luck with it all. You're welcome. Thanks for entering, Daniele. Thank you for the give away!!! Don't stress, everything will be fine. Good to know! Thanks, Dee. I love this series. I can't wait to read this book. Thank you for the chance. Thanks for entering, Candace! Nice to hear. Would really, really like to start reading this series. It would be a great book to read over the holidays. Hope you'll give it a try. Good luck, Dianne. Oh yay, Christmas is early for readers! I cut waaay back on my Christmas activities this year. I am almost done. Sorry for your stress. Sounds like a good way to handle it all. It's always too easy to stress during the holiday season. You've got that right, Sue! Ho, ho. Hadn't thought of it in that way. You're right about reading, Barbara. Welcome, Kathleen! So great to have you as part of the group. I'm quite behind myself this year in regard to my holiday preparations! But the outside lights were up and on the day after Thanksgiving and that's the important thing. The gifts have all been bought-but need wrapping and shipping, the Christmas cards need to be written, and I need to make room for the Christmas tree-which I have to buy. I'd better get off line and start cracking! Good luck with all that, Kathy! Good advice, for sure! Thanks. Also good advice. I may not get back to writing, though. Thanks, Patricia! Hope you enjoy it. You're in a zen place, Jody! Thanks for entering. I love this series! Thank you so much for the chance to win one of the books! Thanks so much, Abby. So wonderful to hear! Good luck! You sound to be of very sane mind, Robin. Will try to do so. Thanks for entering. I really enjoy this series. I am only missing the newest one in the series. It was nice to meet you at the Suffolk Mystery Author's Festival in August. Nice meeting you also, Kathleen. And so glad you enjoy the series. Good luck! Thanks, Celia. Hope you enjoy them! 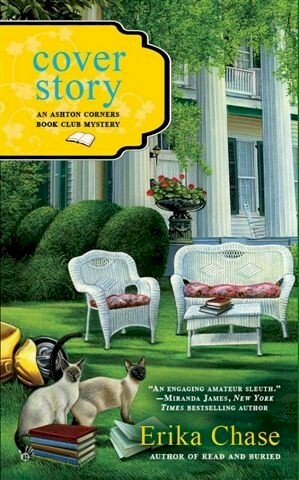 I love this series and have read all up to book 5. Thanks for the chance to win! Thanks so much, Amanda. So happy to hear you love them! Good luck. Nancy R in Ottawa - my favourite way to relieve stress at any time, but especially during the holiday season, is getting together with friends and enjoying good food and conversation. 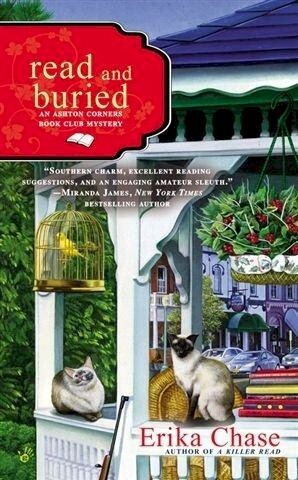 For anyone commenting here - if you haven't read Erika's book club mysteries yet, put them on your wish list; they are a great read! Thanks so much, Nancy! Love your suggestions for a stress-free holiday! Holidays can be stressful, whether or not you're organized. It's often the people involved that do it! You are so right, Libby. Here's to having lots of de-stressing people in our lives! I don't do much for the holidays so it doesn't cause me stress. I don't have much family that I see. I might do some baking this month. Baking is always good, Michelle! Enjoy. I love brownies but I might make pumpkin pies or peanut butter bars with chocolate chips. 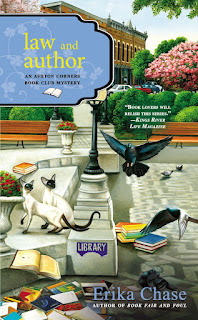 I would love to read the latest in this delightful series. Thanks, Nancy. And, rant away! Most of my stress is self inflicted and I generally cope by reading great mysteries like yours. I think I need to increase my reading and ignore the stress. That's a very good solution, Brittany! You are so right, Renee. We should always keep the true meaning in mind. Good luck, Georgia. Thanks for entering. 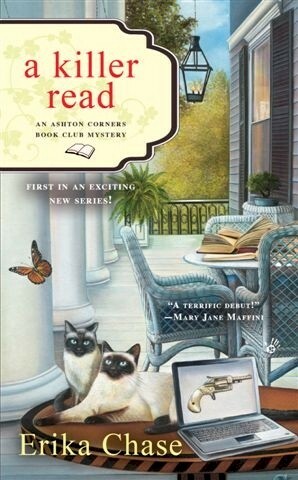 The Ashton Corners Book Club Mysteries series sounds delightful. Thank you for this chance! I used to stress over Christmas but now that I'm older I just try to go with the flow and enjoy each day to the fullest. That's a good policy, Peggy! I hope you will, Kelly. Happy to send some books along, too. Reading helps me, too. Thanks for entering. Sounds like a good and fun way, Margo. I would love to win! I haven't bought one Christmas gift yet! I'm way behind!